On November 28, 1978, a reactor engineer at Browns Ferry Unit 3 in Alabama encountered a bizarre situation during reactor startup following its refueling outage. The process computer indicated serious power-peaking problems in the reactor core. The plant, although at low power overall, appeared to have very high power levels in the bottom region of the reactor core. Every step that the reactor engineer took to correct the problems merely compounded them. He was baffled since these steps had always worked in the past. But this time they not only didn’t work, they made the problems worse. The reactor engineer eventually figured out what was happening and recommended that the plant be immediately shut down. It wasn’t a popular recommendation, but his compelling arguments carried the day and the operators shut down the reactor. The power distribution in the cores of boiling water reactors (BWRs) designed by the General Electric Company (GE) is monitored using local-power range monitors (LPRMs) physically installed within the reactor core region. The figure shows a side view of the reactor core. At Browns Ferry, there were 43 strings of LPRMs at different radial core locations. Each LPRM string contained four neutron detectors at different axial heights as shown by the red rectangles in the figure. Thus, the 172 LPRM detectors provided fairly broad axial and radial coverage of the power, or neutron flux, in the reactor core. The process computer performs a heat balance calculation to determine the overall power level of the reactor core and then uses the LPRM readings to determine how that power is allocated within the reactor. The highest LPRM in each string, the D level detector, was located 18 inches below the top of the fuel assemblies in the reactor core. The C level LPRM was located 4½ feet below the top of the core, the B level LPRM at 7½ feet, and the A level LPRM at 10½ feet from core top, or 18 inches above the bottom of the core. The control rods in BWRs enter the reactor core from the bottom. When a fully inserted control rod is withdrawn a foot, the fuel in the top foot of the core around that rod is direct1y affected. Control rods can be withdrawn in six-inch intervals, called notches, to the fully withdrawn position. During reactor startups, since the control rods are withdrawn from top to bottom, the process of withdrawing control rods tends to initially cause the top of the core to produce more power than the bottom of the core. As control rods are withdrawn to fully withdrawn positions, the initial top peak is distributed more evenly along the entire height of the core. The first process computer calculations at Browns Ferry Unit 3 indicated that there was a serious power peak in the bottom of the core. It was unusual, if not unprecedented, for the core to be bottom-peaked so early. Not believing the process computer output, the reactor engineer ran a computer program that showed all of the LPRM readings. It showed that the A and B level LPRM readings at the bottom of the core were significantly higher than the C and D level readings towards the top. The data indicated that the core was strongly bottom-peaked, apparently confirming the process computer results. The reactor engineer responded by pulling out some more of the fully inserted control rods. This would uncover some of the D level LPRMs, which should increase power in the top of the core and flatten out the axial power shape. However, the computer readings showed a much more pronounced bottom-peaked power shape. The A and B level LPRM readings had gone up while the C and D level readings were about the same. The peaking problem had gotten worse instead of better. The reactor engineer tried withdrawing some more fully inserted control rods. Again, the bottom-peaked power shape got worse. 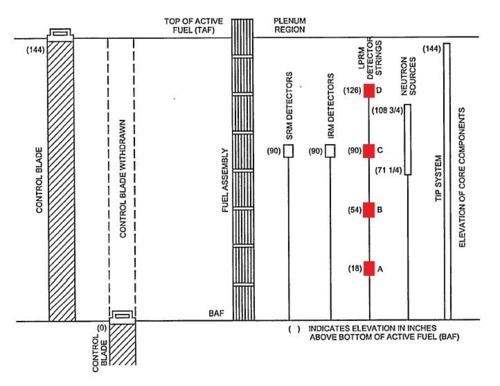 The most recent movements had withdrawn control rods past some of the D level LPRMs at the top of the core, yet these LPRM readings had not changed. But for some reason, the A level LPRM readings in that location had increased considerably. The control rods were still inserted past that level, so there was no explanation for the power in the bottom of the core to increase. The reactor engineer selected one control rod to move. He had the operator move that one control rod from its position slightly above a D level LPRM to a position slightly below that detector. Such an action should cause that LPRM reading to increase significantly as it responds to the power increase. But the D level LPRM reading did not change. However, the A level LPRM reading in that string nearly doubled. Somehow, moving a control rod at the top of the core caused the LPRM reading in the bottom of the core to rise. With a few more individual control rod movements, the reactor engineer proved convincingly that the LPRM responses were exactly opposite of how they should have been. Faced with this evidence, management accepted the reactor engineer’s recommendation and shut down the plant. The records from the refueling outage showed that all of the cables to the LPRM strings had been disconnected during the outage to allow work under the reactor vessel. A crew of workers meticulously labeled each cable they disconnected with its core location and elevation (e.g., A, B, C, and D). When the work under the reactor vessel was completed days later, a different crew reconnected all the LPRM cables. Unfortunately, the D cables had been connected to the A LPRMs, the C cables connected to the B LPRMs, the B cables to the C LPRMs, and the A cables to the D LPRMs. The second crew has assumed the A level to be the top-most LPRM detector location when it actually was the bottom-most location. After the reactor was shut down, another team of technicians swapped the LPRM cables back to their proper configuration. As discussed in Fission Stories #34, different perceptions of labeling conventions caused this problem. Although challenging to achieve, procedures and oral instructions must be as explicit as possible to avoid traps for workers to fall into.